Introduction. Assynt has three resident terrestrial reptiles, Common Lizard, Slow-worm and Adder, and three very occasional marine visitors, Green, Loggerhead and Leatherback turtles. The Common Lizard Zootoca vivipara is the most widespread of our resident reptiles, and may often go unreported. Adults are most often seen sunning themselves on rocks or in low vegetation, but can disappear in a flash. To the practised observer, a rapidly-moving wriggle in the right situation, seen out of the corner of the eye, is probably good enough for a record, but a proper view is better. Adult common lizards are about six inches (15cm) long, and brown above, with longitudinal rows of dark and light markings. Males and females differ in colour, particularly on the underside; males have bright yellow or orange bellies, usually dark-spotted; females have paler yellow, blue or grey bellies, with few spots. These characters are easy to see on road or other casualties, but beware, lizards are difficult to catch, and may shed their tails if you try. Adults usually emerge in March, sometimes on warm days in February. They produce 4-10 young in July (see Les Pearce’s photographs from Badnaban), and go into hibernation about October. 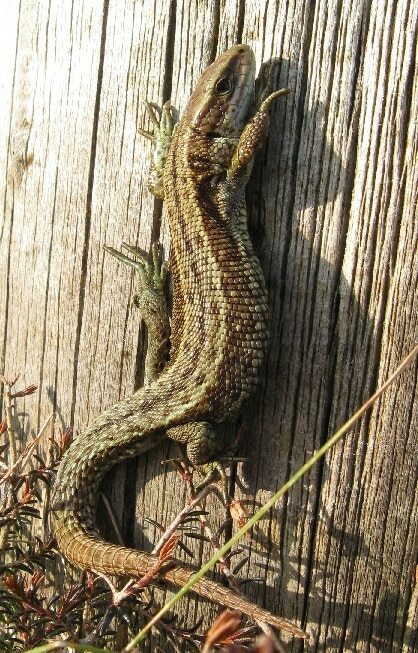 Common lizards have been reported in coastal parts of Assynt from Inverkirkaig round to Ardvar, inland along the north side of Loch Assynt and, sparingly, down the limestone corridor as far as Cam Loch and Knockan. They are most often seen in dry heathery areas, but will dive into water to escape attention. There are few records from the Stoer peninsula, but they do extend quite high into the hills. They are sometimes caught by cats (Kerrachar, 2002), by other mammals, birds, and almost certainly adders, but local information is lacking. They do sometimes carry sheep ticks. It is likely that their numbers have been reduced locally by uncontrolled muirburn, but their population in Assynt is still probably 5,000+. The Slow-worm Anguis fragilis is the other lizard found locally, albeit a legless one. It is occasionally seen basking on the ground, but more often individuals are found under boards and sheets of corrugated iron (which should be carefully replaced). Slow worms are unmistakable in appearance, smooth, shiny, bronze in colour and up to 18 inches (45 cm) long. Adult females retain the central dark dorsal stripe that is so conspicuous in the young and have black bellies, while the males lose the stripe with maturity and have speckled bellies. The adults can be handled with care, but will, again, shed their tails if alarmed. 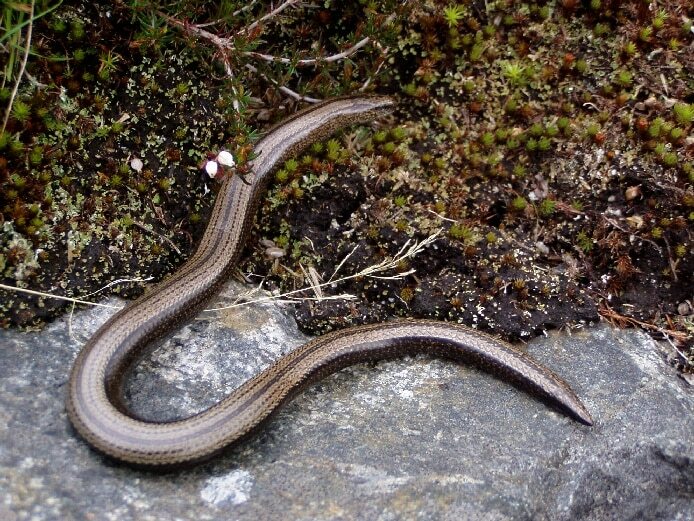 Slow worms usually emerge from hibernation in March, although they have been noted as early as 8th February (Recharn, 1996). Their 6-12 young are born in July and they move to their hibernation quarters in October, although they have been seen as late as 9th December. They burrow, are mainly nocturnal, and feed on small invertebrates, especially slugs and earthworms. Most of our local records are from the drier, more fertile, ground around the coast and a short way inland, from Inverkirkaig round to Gleann Leireag, with other recent records from Glencanisp Lodge, Little Assynt and Loch Assynt Lodge. A sloughed skin was found at Stoerhead Lighthouse in 2009. They are sometimes caught by cats and often end by as casualties on the road. There are no recent records from the limestone corridor between Unapool and Knockan. A first estimate of their population in Assynt is 1000+. The Adder Vipera berus is probably the least common of our three resident reptiles, although it is difficult to be certain, since most records are of one-off sightings. Adders are quite unmistakable, up to two feet (60cm) long, with a dark zigzag stripe along the back and a forward-pointing V on the head. Females are larger than males, patterned in dark reddish brown on lighter brown, males smaller and black on silver-grey. An almost pure black individual was photographed at Aultnachie behind Knockan in July 1994, the pattern almost indiscernible. Do not handle adders; their bite is venomous. A boy bitten by one near Loch Awe in the 1980s, although air-lifted to Inverness, was very poorly for a while. Adders emerge locally in April; five females were seen one day in that month basking close to a stone and turf sheiling dyke in Gleann Leireag, probably their hibernation site. The young are born in August-September. A female and six young were seen at Cam Loch in August, but a juvenile noted at Loch Uidh na Geadaig on 1st April 2005 must have been born the previous year. They go into hibernation in October and there are old reports of aggregations of adders found in hibernation dens. Not much is known about their prey and predators locally, but a male found dead on the road at Glenleraig contained an adult field vole half its own weight, and common lizards are said to be favourite prey. An adder was caught by a terrier at Inveruplan in 1995; another was seen dangling from the talons of a buzzard. 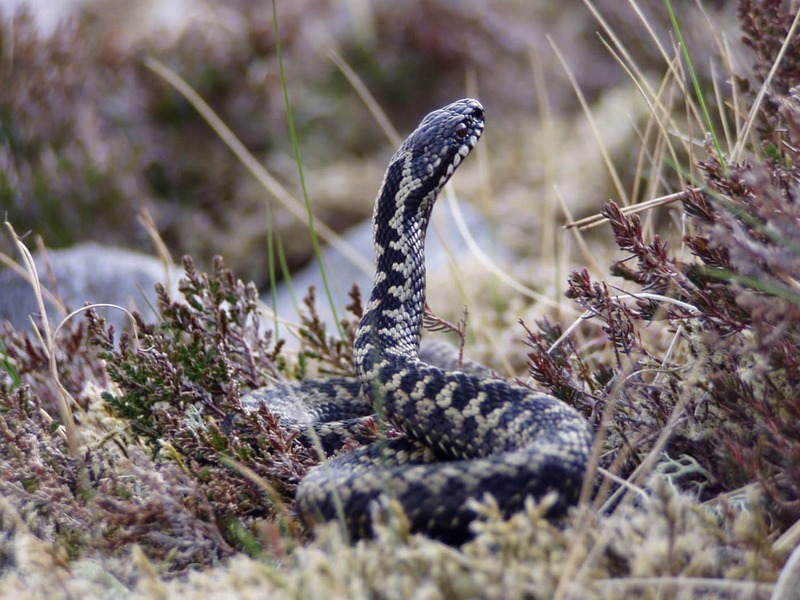 Adders are apparently widely, if sparsely, distributed across the Assynt landscape, though they are not common in the busier coastal crofting townships. South-facing slopes are particularly favoured and they have been seen high in the hills, as at 600+m on Quinag in 2006. There is a concentration of records in the Nedd/Glenleraig area, but this may be observer bias. Several have been seen recently on Little Assynt. Adders may well have been commoner in former times; the one-time school on Loch Assynt is said to have been constructed on ‘stilts’ because of the prevalence of adders in that area. It is likely that uncontrolled muirburn has reduced their numbers in recent decades, and it is known from elsewhere that they are unable, or unwilling, to recolonise areas until the vegetation and common lizard populations are fully recovered. An estimate of the current Assynt population is 1000+, though this could be on the high side. What to record. Information about the three resident species is patchy, however many of the records have recently been collated and computerised – Amphibian and Reptile Records. All observations are worth reporting, particularly from less well frequented areas. A 6-figure grid reference is useful, although a 4-figure one will suffice. Photographs to illustrate these notes would be particularly welcome. Send these to assyntwildlife@gmail.com. 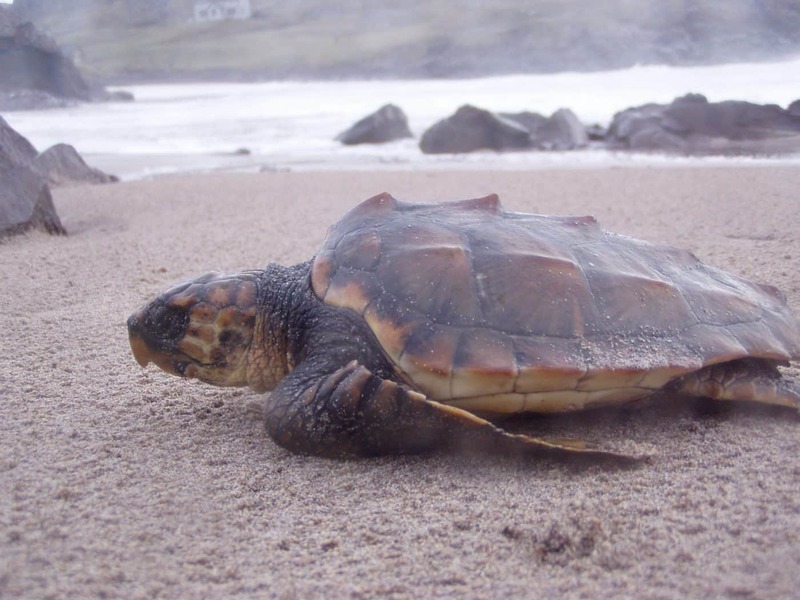 Three species of marine turtle have been recorded on or just off the coasts of Assynt. A Green Turtle Chelonia mydas found by Phil Henderson on 24th February 2002 at Achmelvich was only the 5th stranding of that species for the UK. Its small size (45cm) indicated it was probably a youngster around five to ten year’s old. A most mortem by Bob Reid at the Scottish Agricultural College in Inverness confirmed it died of hypothermia. 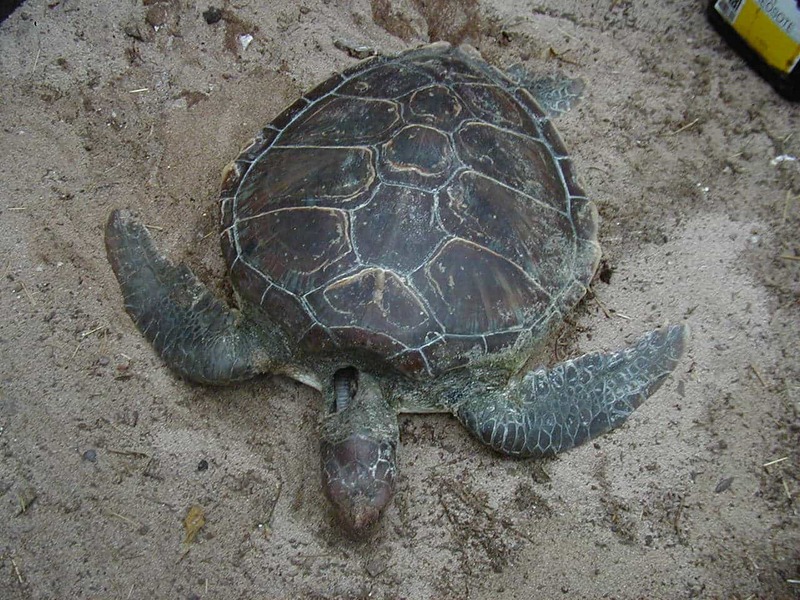 DNA results showed that the Achmelvich turtle was genetically closer to the Indian Ocean green turtles than the closer but critically endangered Atlantic population. A Loggerhead Turtle Caretta caretta was washed up on the beach at Achmelvich on 14th January 2007. At 30cm long, it was immature and had probably originated in the Caribbean. Another individual of this species was stranded at Lochinver on 30th September 1952. On 18th October 1993 Donald Macleod of Drumbeg found that a huge Leatherback Turtle Dermochelys coriacea had become entangled in his creel ropes off the Point of Stoer and had, unfortunately, drowned. Although it was too big to be hauled into his boat, he tied it to the side and brought it ashore at Culkein Drumbeg. It was 7ft (210cm.) long and 7.5ft (225cm) across the flippers and must have weighed half a ton. Its skull can be seen in the Ranger’s room at the Visitor Centre. This species is now thought to visit British waters regularly following swarms of its main prey, jellyfish. Please inform Andy Summers, Highlife Highland Ranger a.s.a.p. about any turtle strandings on 01571 844654. Further information. For good illustrations of terrestrial reptiles see Complete British Animals by Paul Sterry, first published by HarperCollins in 2005. A more discursive text is the New Naturalist volume Amphibians and Reptiles by Trevor Beebee and Richard Griffiths, first published by HarperCollins in 2000. Relevant websites are those of the British Herpetological Society www.thebhs.org and Amphibian and Reptile Conservation www.arc-trust.org . Advice on how to deal with turtle strandings (the UK Turtle Code) can be found at www.mcsuk.org.